Known Hazards Catnip has diuretic properties and may increase amount and frequency of urination. Smoking catnip can produce euphoria and visual hallucinations. Sedation. Women with inflammatory diseases of the pelvis or are pregnant should not use. Care if using and driving or using machines . Habitats Roadsides and near streams. Hedgerows, borders of fields, dry banks and waste ground, especially on calcareous and gravelly soils[4, 17]. Nepeta cataria is a PERENNIAL growing to 1 m (3ft 3in) by 0.6 m (2ft). It is hardy to zone (UK) 3 and is not frost tender. It is in flower from July to November, and the seeds ripen from September to October. The species is hermaphrodite (has both male and female organs) and is pollinated by Bees. Cataria vulgaris. Calamintha albiflora. Glechoma cataria. Nepeta mollis. Young leaves - raw[7, 20]. A mint-like flavour, they make an aromatic flavouring in salads[7, K]. Older leaves are used as a flavouring in cooked foods[2, 27, 105]. They can be used fresh or dried to make an aromatic herb tea[21, 105, 183]. The tea should be infused in a closed container in order to preserve the essential oils, boiling is said to spoil it. Refrigerant; Sedative; Stimulant; Stomachic; Tonic. Catmint has a long history of use as a household herbal remedy, being employed especially in treating disorders of the digestive system and, as it stimulates sweating, it is useful in reducing fevers. The herbs pleasant taste and gentle action makes it suitable for treating colds, flu and fevers in children. It is more effective when used in conjunction with elder flower (Sambucus nigra). The leaves and flowering tops are strongly antispasmodic, antitussive, astringent, carminative, diaphoretic, slightly emmenagogue, refrigerant, sedative, slightly stimulant, stomachic and tonic[4, 7, 9, 14, 21, 165, 218, 238]. The flowering stems are harvested in August when the plant is in full flower, they are dried and stored for use as required. An infusion produces free perspiration, it is considered to be beneficial in the treatment of fevers and colds. It is also very useful in the treatment of restlessness and nervousness, being very useful as a mild nervine for children. A tea made from the leaves can also be used. The infusion is also applied externally to bruises, especially black eyes. The plant is said to deter insects such as ants and flea beetles[14, 20, 201] as well as rats and mice[4, 200, 201]. (The idea behind it being a rat repellent is probably based on the plants attraction to cats, see notes above.) A strong infusion can be used to repel fleas from carpets or the fur of animals. An extract from the leaves (called nepetalactone) has herbicidal and insect repellent properties. The freshly harvested flowering tops contain 0.3 - 1% essential oil by distillation. It is mainly used for medicinal purposes. The dried leaves retain their fragrance and can be used in pot-pourri. Easily grown in a light sandy soil in a sunny position. Succeeds in heavier soils if the drainage is very good. Plants are hardy to about -25°c. Catmint emits a scent that is irresistible to many cats, who will then avidly attack the plant[4, 7, 20, 46, 200]. The smell is said to be similar to certain cat hormones and is more effective with male cats. Quite often a cat will completely destroy even a fairly large plant, small plants especially might need protection until well established[K]. Sometimes grown in the herb garden, there are some named varieties. 'Citriodora' has lemon-scented leaves that are more attractive to people and less attractive to cats[183, 187]. If the plants are cut back hard when they are flowering a second crop of leaves will be produced. Members of this genus are rarely if ever troubled by browsing deer or rabbits. Catmint is a good companion plant to grow in the garden. It is said to repel various cabbage pests, aphis (including peach aphis), flea beetles, cucumber beetles, squash bugs and ants from plants they grow near to. The flowers are very attractive to bees. Seed - best sown as soon as it is ripe in a cold frame in the autumn. The germination of spring sown seed can be erratic, it is best sown in a cold frame. Prick out the seedlings into individual pots when they are large enough to handle and plant them out into their permanent positions in the summer. The seed remains viable for about 5 years. A fast-growing plant, the seedlings can reach flowering size in their first year. If you have sufficient freshly ripe seed then it is well worth trying a sowing outdoors in situ in the autumn. Division in spring or autumn. Very easy, large divisions can be planted out direct into their permanent positions. We have found that it is better to pot up the smaller divisions and grow them on in light shade in a cold frame until they are well established before planting them out in late spring or early summer. Basal cuttings in late spring or early summer. Harvest the shoots with plenty of underground stem when they are about 8 - 10cm above the ground. Pot them up into individual pots and keep them in light shade in a cold frame or greenhouse until they are rooting well. Plant them out in the summer. 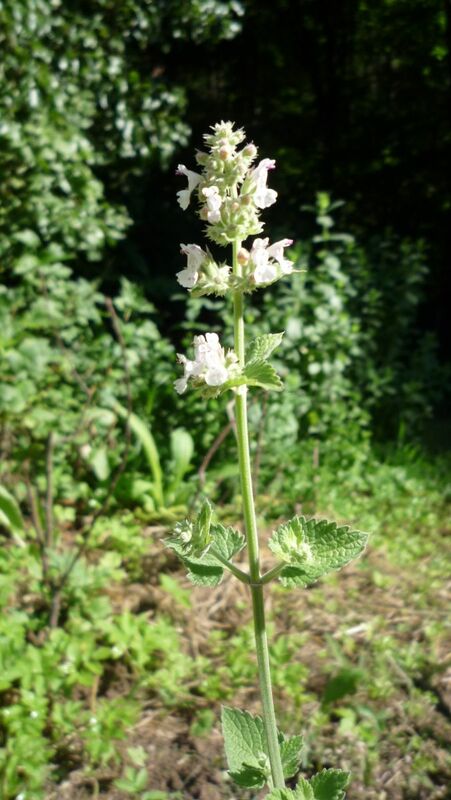 A caution when using catnip essential oil as an ingredient in mosquito repellants used daily: as a concentrated essential oil,even when used in small quantities, the catnip's emmenagogue effect is increased. And also noted is it's ability to cause irritability, which is not mentioned very often in the literature on catnip. I did find a reference at http://www.drugdigest.org/DD/PrintablePages/herbMonograph/0,11475,4093,00.html which said: Catnip's safety has not been determined in children. In one documented case involving a small child, swallowing excessive amounts of catnip caused irritability and excessive sleepiness. I am having great trouble finding these plants to buy. An Italian friend who keeps a cat in a flat in London says catnet is essential for her cat and easy to buy in Italy. Does anyone know where these plants can be bought?